There are times when doing daily posts gets difficult for lack of topics. I typically have several days worth of ideas and photos queued up, so each morning it's just a matter of picking which topic I feel like writing about. Sometimes though, the list dwindles or disappears entirely, and I get nervous that I won't be able to think of a topic for the next morning's post. That's when I grab the camera (weather permitting) and head out into the garden, hoping I'll find something worthwhile to share. This happened two days ago when I was looking around the yard thinking "there's nothing here exciting me", a little knot of worry starting to tie in my belly. 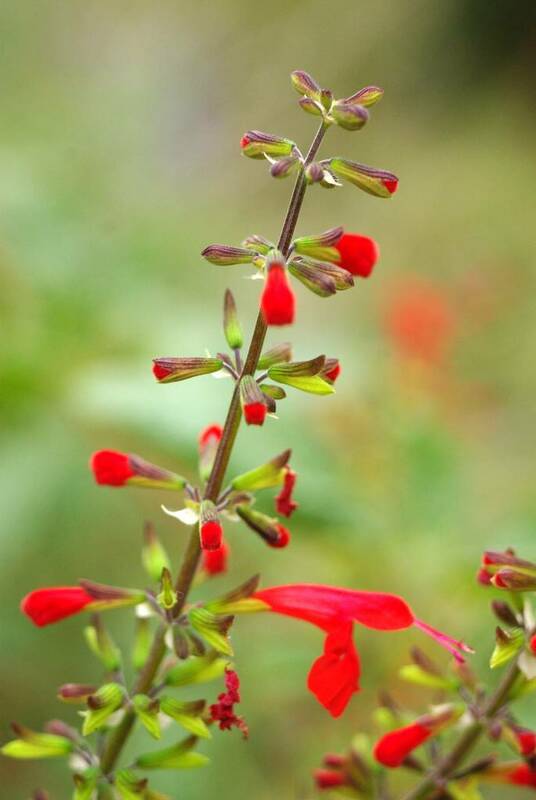 Then I saw the Salvia coccinea and thought "I'll take some Salvia photos -- there are a couple in flower right now!" What I realized is I have no fewer than ten different species of Salvias in the garden right now. Ten! Two of them are not blooming right now, but that still leaves eight, so let's get started. The most noticeable most years is the coccinea or "Scarlet Sage". This grows as an annual for me and has been in my garden almost from the start: the first photographic evidence I have of this in my early garden is from 2003, but I may have had it a year earlier. This has been reseeding every year since, and appears in different forms. My favorite has the "black" calyxes -- the all-green forms don't look as good to me. This year I have fewer of these than usual. Was it the mild winter that somehow interfered with reseeding? This takes almost every single day of growing time we have to flower, and you can see that it's just beginning now. I'll dig these up after it gets cold and/or take cuttings to overwinter. Or I'll just buy new small plants in the spring. I may try a heavy mulch over one of them in the ground -- this may work, especially if we have another mild winter. Hummingbirds love these fuzzy, fuzzy blooms, but most of the hummers have left already. I'll have to get these going earlier next year! 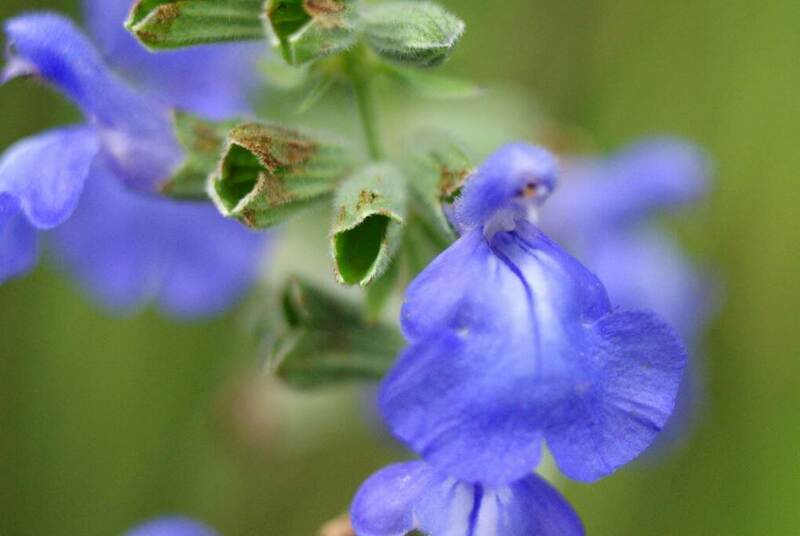 Enough of these tender varieties -- how about a Missouri native Salvia azurea! 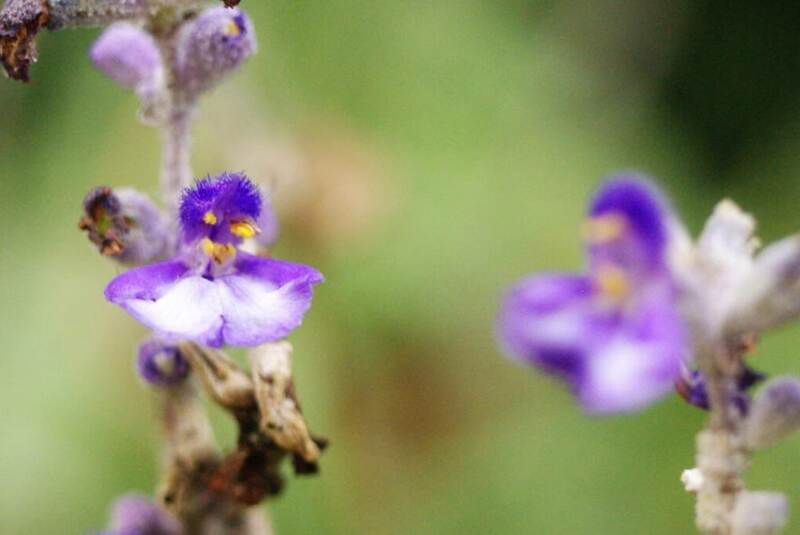 The common name for this one is "Blue sage" (how did they come up with that one?) and I always forget I have it. It emerges quite early in the year and if I don't pinch it back once or twice (I usually don't) it gets quite tall and may flop over. It's supported by other plants this year it seems. It does gently reseed, but I should be more proactive, collect seed, and start some more of these in the spring. It would be nice to have a larger patch of these in my "prairie" area. It does tend to get woody and poop out after a few years though, but mine have been going strong for longer than that. Usually flowers in late spring or oearly summer, but the plant appears to have put up a single fall bloom just for these photos. I actually prefer the foliage to the flowers on this species and wish it wouldn't bloom at all. I'll live with them though. 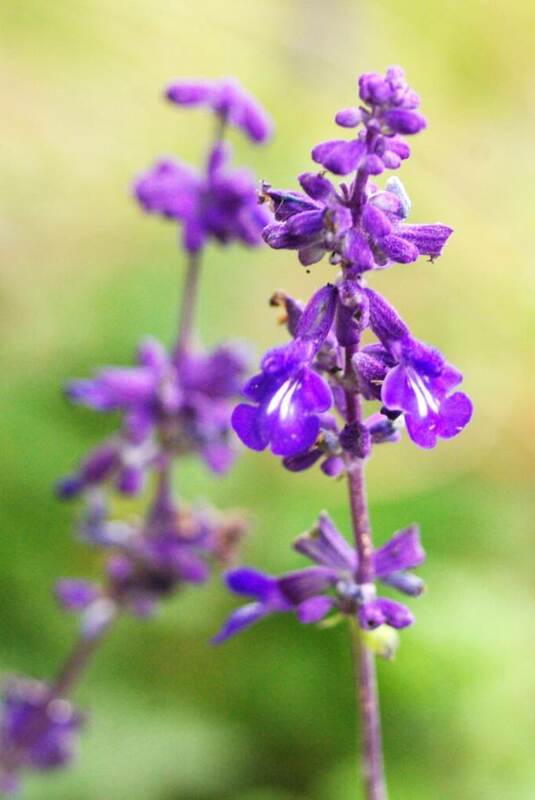 Another cold-hardy one is Salvia greggii, or "Autumn sage". The one I grow is 'Wild Thing'. I chose it several years ago from the High Country Gardens catalog because it specifically mentioned growing in a St. Louis garden for many years. It's certainly done well for me, but if you're not into fluorescent pink then you should probably skip this one -- the blooms are just electric! I wouldn't have chosen this one had I known it would be so "in your face", but now that I have it I'd never get rid of it. It's just great, and blooms for such a long time! Another one that I originally purchased as an annual before realizing it was perennial some winters or just keeps reseeding in the same spot is Salvia farinacea 'Victoria Blue' -- or at least that's what I think it was. I only noticed the powdery mildew when taking this photo, but the plant is in bad shape. So I'm not sure what either of these Salvias are right now. I may still have the tags for the mildewed one, but I'll have to dig around. It's "Pineapple Sage" Salvia elegans. While the foliage of most Sages is quite unappealing to the nose, pineapple sage is the exception as you might imagine. Delicious, and useful in drinks I've heard but I've never tried it. Another late bloomer, I wish this one would start sooner so the hummingbirds would have more time with it. The other Salvias that I have that are not in bloom now (they are early-summer bloomers) are Salvia nemerosa 'May Night' and Salvia nemerosa 'Caradonna'. If I'm diligent with the pruners I can get them to rebloom, but not this year. 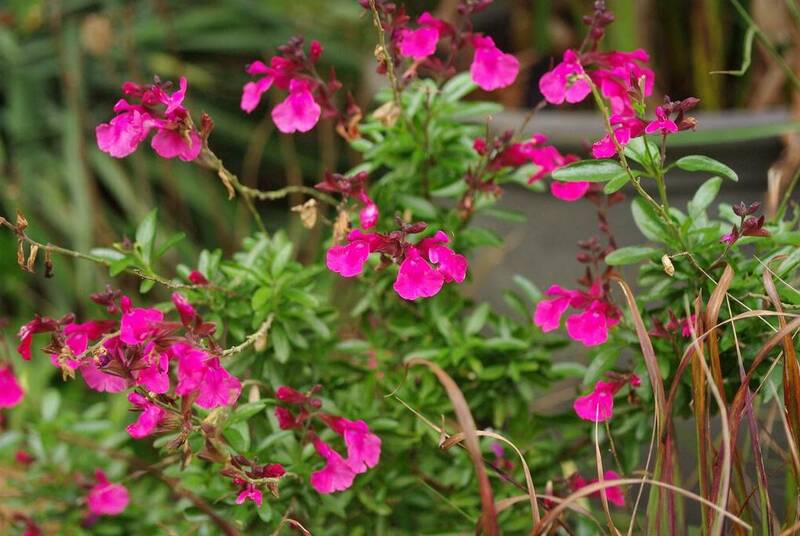 If you're not growing at least one of these Salvias, add one to your must-have list for next year! 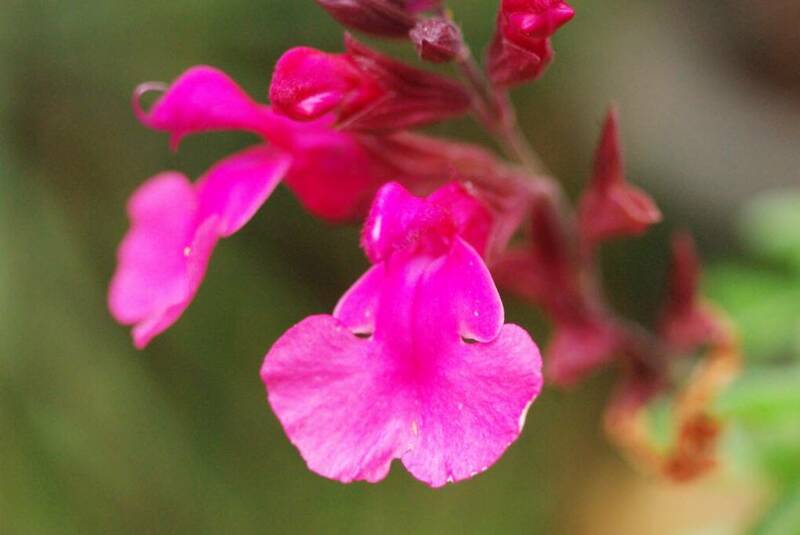 I love Salvias...such great plants! Salvia leucantha is one of the very few plants that isn't quite hardy here...but that I really wish would be! I've been really happy with Salvia 'Purple Rain' since I planted it...really wonderful, deep purple blooms...and blooms from late spring until frost. Salvias are among my favorites. 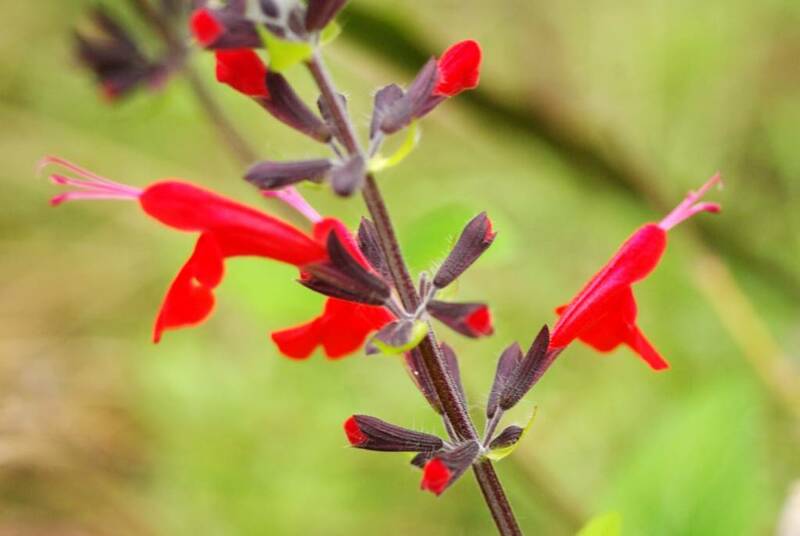 I don't know how many we have but I love the various autumn sages and Salvia microphylla 'Hot Lips'. You should see if you can find it locally. 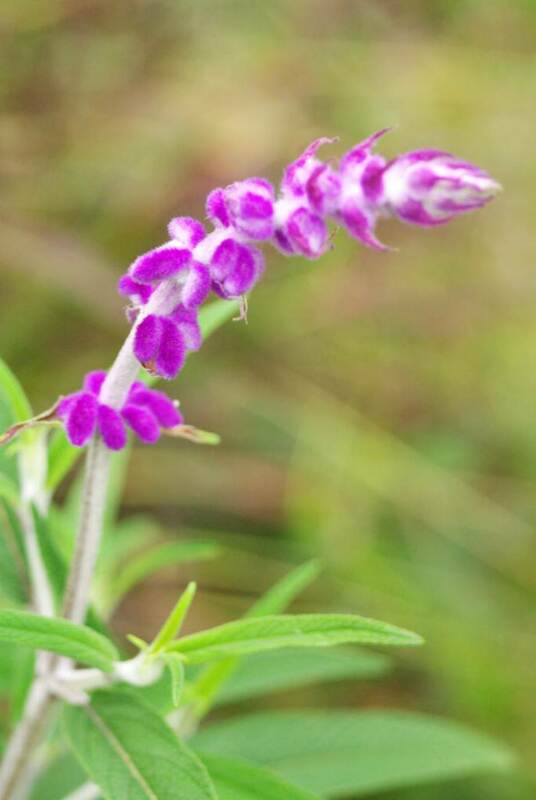 I just bought a salvia that's new to me, Salvia reptans. I love both the finely dissected foliage and the cobalt flowers. Hardy to zone 5 so it should be fine in your garden. The salvias and the sages are high on my list of faves. I like the contrasting calyxes too, and that's why I bought the Black and Blue salvia years ago, which spreads quickly making wonderful clumps and it's also easily pulled up for sharing or compost pile. 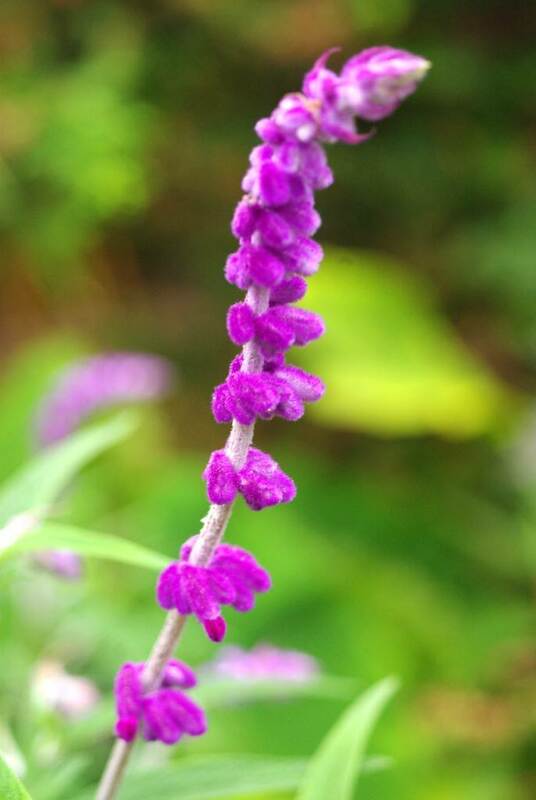 I just bought a new one called Salvia 'Limelight'. The blooms are electric purple against lime green calyxes with dark green leaves. Even when the blooms fall, the calyx sprays look great. I'm very happy with it. It will bloom 'til frost. 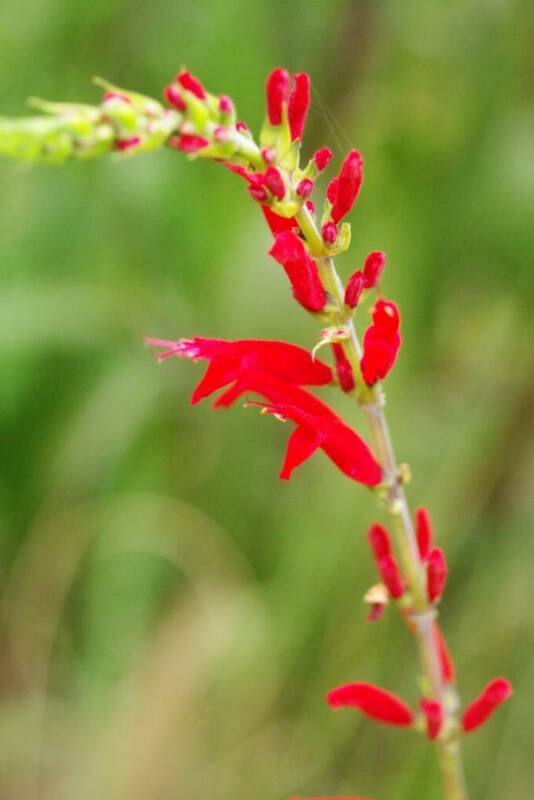 I like your Sage coccinea w/the black stems. 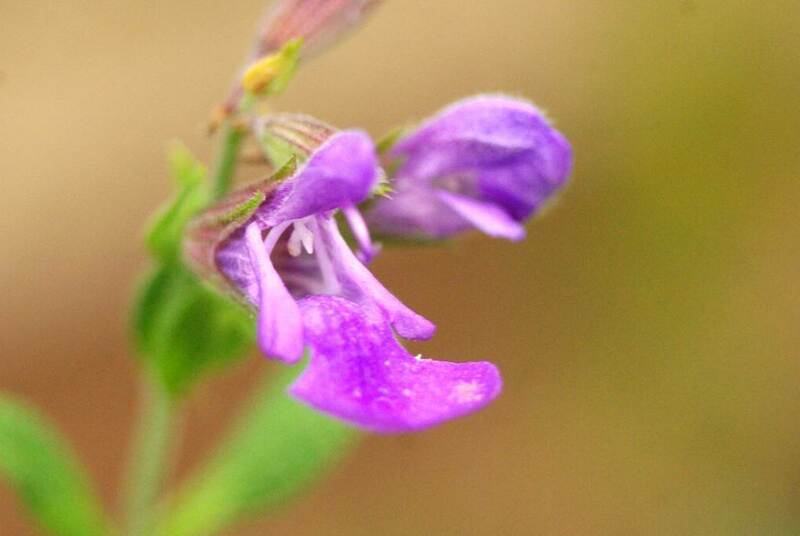 What would we do without the salvias? Well I could do without S. farinacea. I'm sick of pulling it out and if it gets too big it becomes an onerous task. 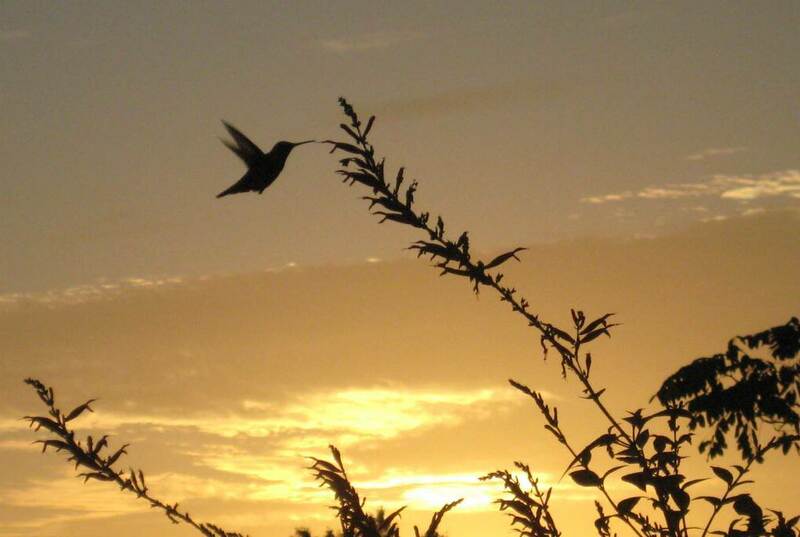 Love your photo of the hummer. 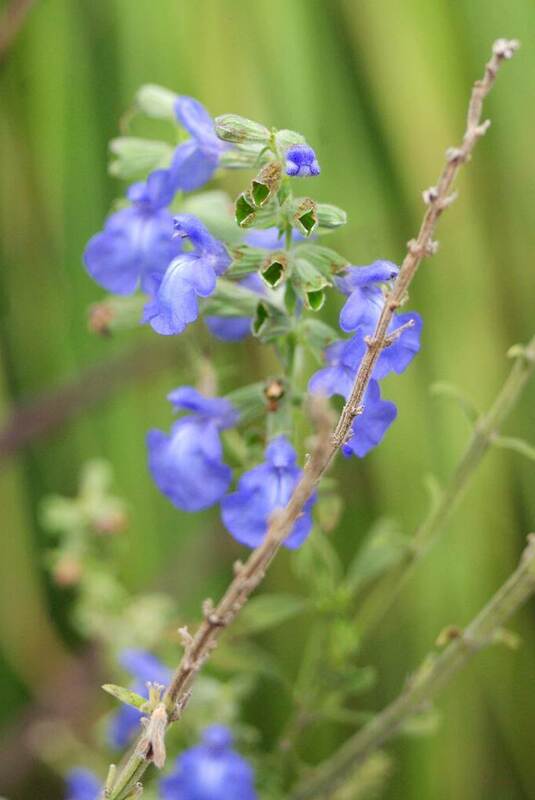 My favorite SAlvia is Black and Blue. I try to get a few plants very year. I currently have a new to me Russian Sage that's actually getting ready to bloom- bought it up in Michigan, repotted it when I got home. I'll overwinter it in the pot and next spring after I rebuild a bed, it'll get transplanted to there. As much as an ordered garden can be attractive, for me wildflowers are still my first love. My garden has an ordered section where I dutifully manage all that goes on, but at the far end I leave it a little wild and in truth it’s my favourite part of the garden. 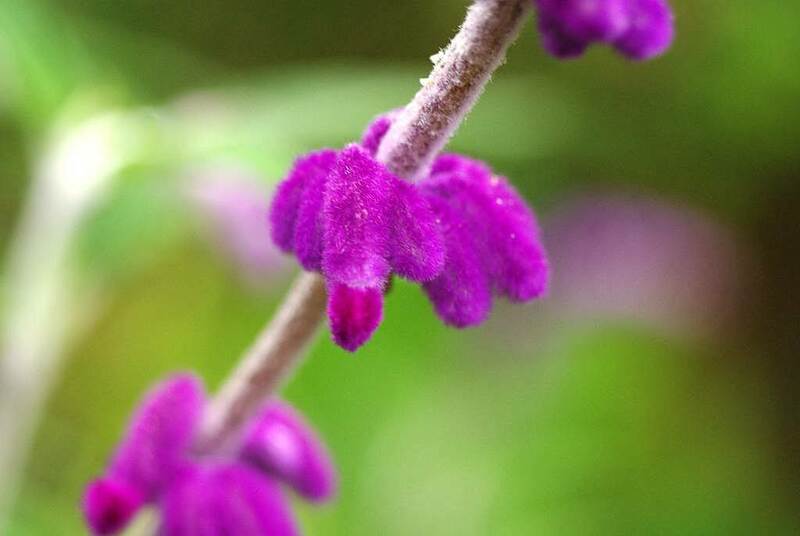 I confess I gain much of my knowledge from reading the instruction tags when I buy a new kind of plant but I've got various strains of salvia in my wild section. I see them, I love them, yet I don't know what variety they are and after reading your post, did a little research of my own. Apparently theirs 700 to 900 different species so I'm not confident I will be able to identify all but I have a healthy respect for this beautiful unassuming little plant. What struck me about your post is the way you seem to know so much about each individual variety in your garden. It’s more like they are pets and you even know there character. I was impressed to say the least and you put trial and error gardeners like me to shame. The photos are great and my respect for these hardy beauties has been enlarged by your post. 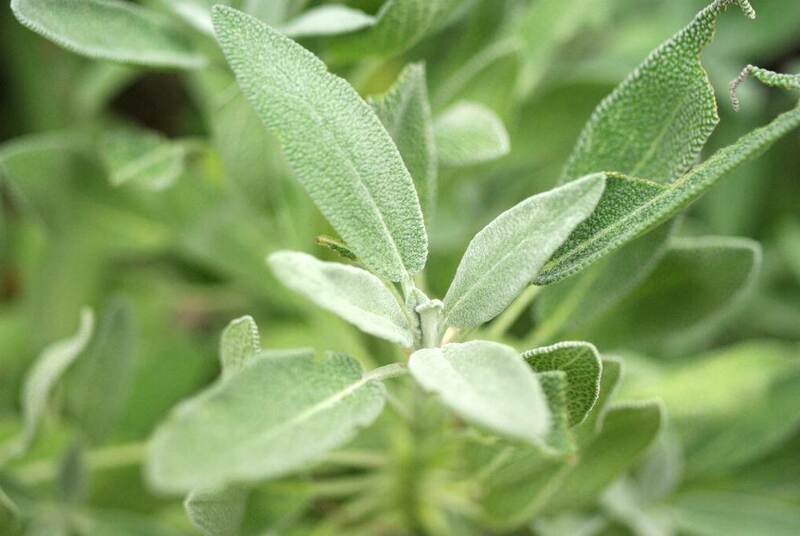 How devine to see so many sage varieties in your garden. I am building up my selection. Love the fuzzy Mexican sage, but the blue one is my best! 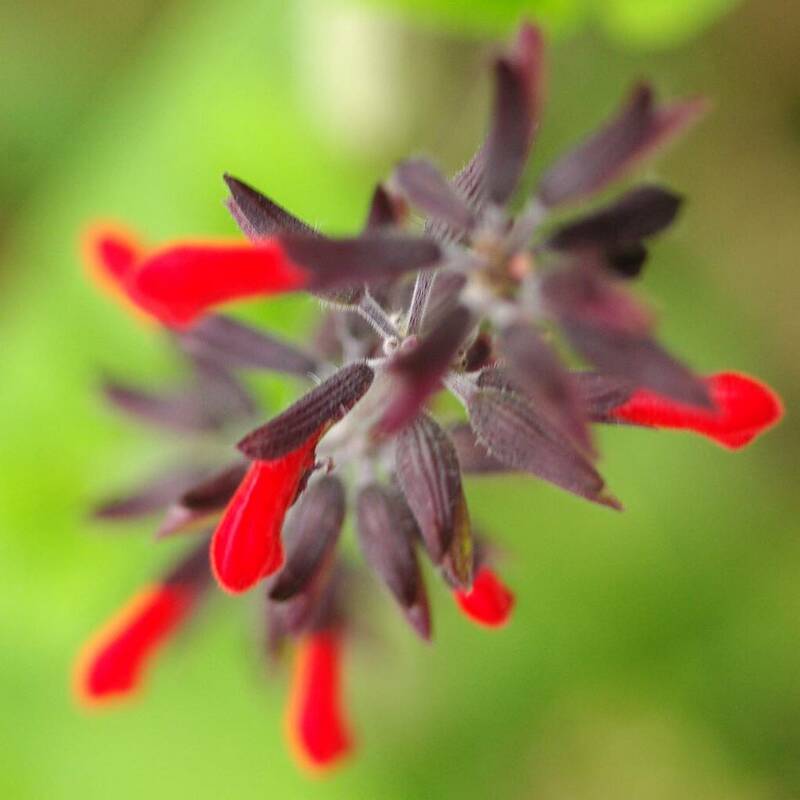 I'm also "collecting" Salvia now - well, I have 5 varieties and I adore them all.